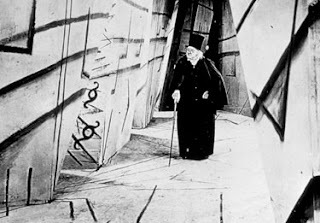 The Cabinet of Dr. Caligari (Das Cabinet des Dr. Caligari, 1920) was produced during the cultural flowering of the German Weimar Republic after World War I and was one of the great early German Expressionist films. The producers had originally chosen Fritz Lang to be the director, but he had other obligations, and so Dr. Robert Wiene was tapped to direct the film. The story concerns a psychotic killer, Dr. Caligari, who hypnotises a somnambulist (a person who is perpetually asleep but who can be awakened briefly) to perform grisly murders at his choosing. Two friends, Alan and Francis, see Caligari at a village fair exhibiting for a concession his somnambulist patient. 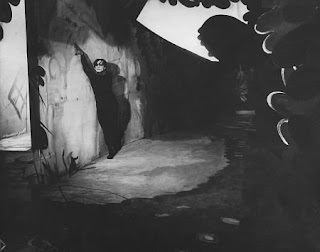 After Alan is later murdered (by the somnambulist), Francis suspects that the real culprit is Caligari, and both he and the father of his girlfriend, Jane, set out to expose Caligari as the evil mastermind. They eventually succeed at this, but not before the somnambulst abducts Jane and nearly kills her. When Caligari is finally confronted by the authorities with the evidence, he becomes violent and has to be secured in a straitjacket. This entire story is told by means of a narrative framing device such that Francis is initially shown at the start of the film to be relating the tale to a companion on a park bench. At the end of the film, we go back to Francis, and now it is revealed that it he who is an insane inmate of the asylum and that the whole story was a deranged fantasy on his part. What makes the film unique and enduring is that the entire world depicted is skewed and distorted in a nightmarish fashion. This is Expressionism in its pure form: the external world is twisted to reflect the emotional state of the storyteller. There are almost no right angles anywhere. All the buildings, windows, and doors are slanted and deformed. Inexplicable lines and dark shadows mark the walls of buildings. The chairs of city officials are absurdly elevated to reflect the dominating and unapproachable status of their officious occupants. The original script of the screenwriters, Hans Janowitz and Carl Mayer, only had the enframed narrative, the tale of Francis. Their intention was to cast the horror tale as a critical commentary on German society that had sent millions of young men to their deaths in the World War. 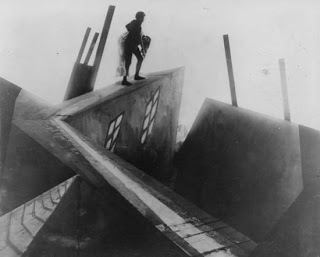 Caligari was to be symbolic of a deranged ruler who had sent so many soldiers off like sleepwalkers to commit uncountable murders on the battlefield. But the producers of the film decided, apparently for commercial considerations, to include the framing device. By doing this, Francis’s own tale of Caligari is reduced in credibility to be the deluded ravings of a madman and so the impact of any political implications is diminished. Nevertheless, the film as it stands today is perhaps even more cosmically disturbing than if the framing device had not been employed, because it now calls into question our own basic reference system. In the backs of our minds, we may even harbor an unconscious suspicion that perhaps Francis is somehow right after all and that he is being held prisoner by a diabolically insane asylum director. One of the interesting expressive visual techniques in the film is the heavy use of iris shots, which localize the view to a small circular vignette in one part of the screen, with the rest of the shot darkened. These are often use to "fade" into or out of a scene by localizing attention to one area of interest, and this was a popular technique during the silent film era. In this film, where we are constantly striving to find our way in a distorted reality, the technique fits in very and is particularly effective. Some criticise the film on the basis of their own allegiances to formal theories of art. Some “realists”, for example, dismiss Expressionism as merely decorative and meaningless. Others, Expressionist adherents, criticise the film for occasionally straying slightly from the demands of aesthetic consistency. I think it is best to take the film as it is and to forget the dogmas of artistic movements. Other critics complained that the sets were too “flat” and lack depth. It is true that there is a foreshortened look to the various settings, which gives the film something of a theatrical appearance. However, I feel that the frame still has “depth” to it, even if foreshortened, and the foreshortening actually has an “interiorising”, claustrophobic effect that has its own alarming power of suggestion. Leftist critics, such as Kracauer, complain that the original politically-oriented script of Mayer and Janowitz was defanged by the framing narrative. But to me, the framing mechanism has its own positive features, and one should examine the film as it stands, as opposed to what it might have been. And, finally, some critics dismiss the film, because Robert Wiene does not stand among the major film “auteurs”. That is so, but filmmaking is ultimately a collaborative art, and on many occasions a fine film can be made as the happy result of a collection of contributors. Forget those critics; this is a classic and should not be missed by any serious filmgoer.